Perhaps the title of this article is a bit misleading as you soon will discover or maybe you might think that this writer (me) doesn’t realize that the United States Navy’s special warfare operators, known as SEa Air Land and that I failed to properly type the acronym? You might be wondering if the subject of this article is touching on the armed forces’ use of a species of sea mammal for war? Please allow me to begin with a personal background regarding my interests and passions and then I will conclude this story with the artifact that, in my opinion, required more elaboration and attention. Since the early 1970s, the Los Angeles Dodgers have been “my” team. I have followed them through each season as long as I can recall. I was born in the same year as one of the Dodgers’ greatest championship seasons. I remember watching the Blue Crew drop three straight games after evening the 1974 World Series with Oakland on Don Sutton’s and Mike Marshall’s combined 11-strikeout dominance of the Athletics. Steve Garvey’s performance (.381 average, on-base percentage and slugging percentage) in that series was just the beginning as he established himself as the anchor of the record-setting infield for the next seven seasons (ending with the departure of Davy Lopes). Seeing the Dodgers take the National League flag two more times only to lose the World Series in both appearances in that decade was heart-breaking but it was also synonymous with their history. Like those Brooklyn fans of the 1940s and 1950s, I learned the true meaning of, “wait ’til next year,” which came for me in 1981. I grew up 1,107 miles from Dodger Stadium which meant that I watched every one of their games on television until 1999. Though my hometown didn’t have a major league team, it was still very much a baseball town with a rich minor league history. The eight Pacific Coast League (PCL) titles alone makes my town the third best since the league was established in 1903, though there were several decades of our principal team’s membership in other leagues also with considerable success (six titles combined among the different lower-level leagues). However, the standout team of the PCL’s history hailed from the City by the Bay; the San Francisco Seals posted fourteen league titles in 55 seasons (the Seals success ranks them 10th in 1925, 44th in 1922, 50th in 1928 and 71st in 1909 in the 2001 Minor League Baseball’s Best 100 Teams). For most of the PCL’s early decades of operation, the league was detached from the rest of professional baseball on the right-half of the United States which served to effectively isolate the ‘Coast League allowing for growth and development and essentially becoming (what many would consider) a third major league (along with the National and American leagues). The PCL’s success and high level of on-field action resulted in the league drawing comparative attendance numbers, and in some cases outperforming many clubs of the PCL’s “big brother” leagues. With their teams’ rosters populated with a significant amount of home-grown talent combined with major-leaguers seeking to extend their careers (after having been released from their major league contracts), fans enjoyed exciting games and a high-level of competition. The PCL’s success also meant that the young stars on their rosters were primary targets of the “big leagues” and were often signed away as the youngters sought more lucrative contracts and the lure of major league play. Others passed through San Francisco as they approached their final games as players. Aside from O’Doul who was a Seal before and after his major league career, San Francisco-native, Hall of Fame infielder and O’Doul’s Yankees teammate, Tony Lazzeri played the 1941 season for his hometown ballclub in the twilight of his career. Following the Seals’ fifth place finish in 1941, team management was faced with questions as to whether a 1942 season would be played and if so, how many current players would be available? All professional ballclubs faced the same concerns and were scrambling to fill roster vacancies as soon as they were notified of a player’s enlistment into the armed forces. Harry Goorabian, a sure-handed short-stop who was new to the team in 1941, clubbed his way to the Seals following his outstanding 1940 season with both the Springfield Browns (class B, Illinois-Indiana-Iowa League) and the San Antonio Missions (class A, Texas League) with a .310 average, would be one of the first to leave San Francisco for the service. Goorabian enlisted into the Army Air Force as a private on January 16, 1942. 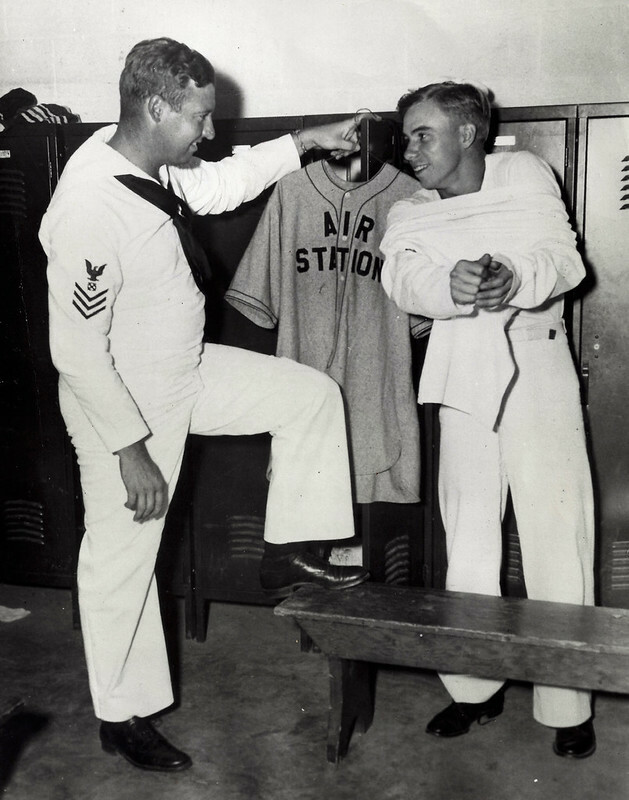 San Francisco would see another Seal head to war as right-handed relief-pitcher Bob Jensen enlisted into the Navy on April 23, 1942 without making an appearance in the young 1942 PCL season. Jensen spent 1941 making 32 appearances (197 innings) and amassing a 10-12 record and a 3.88 earned run average as he worked himself back to the Seals roster from the Salt Lake City Bees (class C, Pioneer League). With San Francisco in 1941, Bob Jensen made two appearances, losing them both. Jensen, a San Francisco native, was signed by the Seals and played his first professional baseball season was with the club in 1940, making 34 appearances (he started four). His record, predominantly as a relief pitcher was 2-3 with an ERA of 5.13 before heading to war. Another Seal infielder, second baseman Al Steele, finished the 1941 season working his way into a part-time role, making 105 plate appearances in 32 of San Francisco’s 176 games. The twenty year-old right-handed middle-infielder batted .242 at during his split season (he also appeared in 20 games with the class B Tacoma Tigers of the Western International League, hitting .228). On April 13, 1942, Steele was inducted at NRS San Francisco as a seaman second class, commencing training as an aviation machinist’s mate at the Naval Reserve Aviation Base, Oakland Airport. Steel would spend the war working with the scout float planes aboard the USS Colorado (BB-45) and USS Witchita (CA-45) in the Pacific Theater. Losing three from the roster to service in the war may be insignificant to some, but 1942 (and the war) was only the beginning. As the United States went on the offensive against the Axis powers in two global theaters, the demand for men (and women) continued to increase. President Franklin Roosevelt’s decision and request to keep the game going was delivered by a (January 15, 1942) letter to Judge Kennesaw Landis. “Baseball provides a recreation,” President Roosevelt wrote, “which does not last over two hours or two hours and a half, and which can be got for very little cost.” However, the drain on the rosters continued throughout the war. Donald William White enlisted into the U.S. Navy on 15 April, 1942 and served until his discharge on September 13, 1945 (source: OpenSFHistory.org). Duster Mails spent 22 years playing professional baseball, finishing his career with the Seals in 1936. When the US entered WWII, Mails, employed by the Seals in public relations at the time, enlisted into the Marines at the age of 48 in 1942. Towards the end of August of 1945, just ten days prior to the Japanese signing of the Instrument of Surrender aboard the USS Missouri (BB-63), teams were already thinking ahead to the boys returning home. Some of the professional players would return in time to finish out the current baseball season. However, most of the team owners began to plan for 1946. My 1930s Seals reproduction baseball cap made by Ebbets Field Flannels in the 1990s is one of four such San Francisco caps that I own. This stars and stripes shield patch was was born from the Hale American HEALTH patch that began as part of a patriotic initiative in 1942. This vintage reproduction Seals cap dates from the early 1990s and was made by Ebbets Field Flannels. My latest addition to my Seals reproduction ballcaps is this 1940s design that employed the Seal logo of the era. The 1950s saw a return to the old style of combined “SF” letters. This was the last cap worn by the team before they were moved to Phoenix in 1958. The Giants revised this design for their caps when they moved into Seals stadium. This cap was also made by EFF. The very patriotic wartime cover of the 1944 SF Seals score book motivated me to purchase. I was scouring auction listings for military baseball-related artifacts when I noticed a piece of ephemera that was colorful and overwhelmingly patriotic and it was associated with the Seals. Without hesitation I submitted an offer and a few days later, it arrived. The piece, a 20-page program and scorebook from the 1944 Seals season, was loaded with stories, features and spotlights on the War and the impacts on the game and the Seals players. 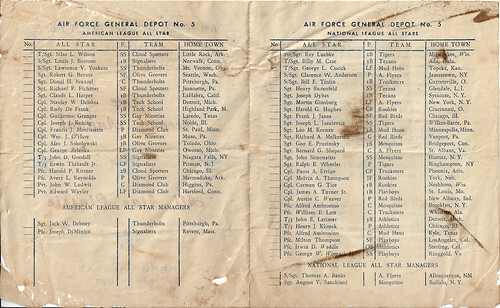 Many of those listed would see some time on military diamonds, playing in leagues and all star games to provide entertainment and respite for troops. The list of those serving included two KIA and one POW among the Seals personnel in the armed forces. Aside from simply enjoying the addition to my collection, I am compelled to learn more about these men that were called out for their war service. My research into the military careers of these men has only just commenced and I am driven by the sentiment that each veteran is due a written (and published) summary of their service (at the very least) in order to preserve their sacrifices made during our national crisis. The total number of Seals players to serve in the armed forces during World War II (that I have been able to ascertain) is 31 with two being killed in action (Ernie Raimondi and John “Jack” Bowen). The third KIA (the second one noted in the scorebook) and the lone POW (Andrew Shubin and Ted Spaulding, respectively) were both Seals employees. From 1941 through the end of the 1945 season, a total of 91 players filled roster spots for the Seals which (when considering the 31 service members) means nearly 33% of the team served in the Armed forces at some point during the war. Aside from the content regarding the players and personnel who served, the program also contains many advertisements and other patriotic subject matter that lends considerable insight to the national conscious and how we were once a unified country in pursuit of a common goal. Purchasing this program was a great choice in that it helps me to shed new light more professional ballplayers who served and revealed yet another man who gave his life for his country that could be honored among his peers at Gary Bedingfield’s fantastic site, Baseball’s Dead of World War II (I have passed my discovery along to Mr. Bedingfield for further research and inclusion). Along with my two in-theater military baseball scorecards (see: Authenticating a Military Championship Baseball and Settling the Score Between the Army and Navy, Hawaii 1944), the 1944 Seals booklet, these pieces of ephemera illustrates the game on both the home front and in theater, how united our nation was in its fight against global tyranny and oppression and the need to find respite (through baseball) as the world was coming apart.